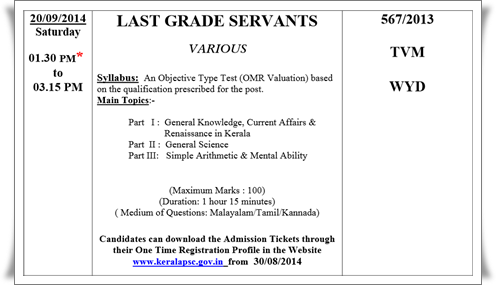 Kerala PSC last grade servant (LGS) 2014 exam hall tickets download will be available at the Kerala PSC website. Kerala PSC last grade servant (LGS) 2014 exam hall tickets details of Kasaragod, Kannur, Wayanad, Kozhikode, Palakkad, Malappuram, Thrissur,, Eranakulam, Thiruvananthapuram, Kollam, Alappuzha, Pathanamthitta, Kottayam and Idukki can be checked from the website. Read more to know about the syllabus and exam details of Kerala PSC Last Grade Servant (LGS) 2014 exam. The Kerala PSC has taken all steps to conduct the Last Grade Servant (LGS) exam 2014 at various districts. The exams will be held in various centres through 7 stages starting from 20th September and ending on 20th December 2014. According to then updated information from the PSC, more than 5 lakh applicants from various districts will appear for the exam in their respective districts. After finalization of the results, the ranked list for the posts will be published on 30.06.2015. An objective type test (OMR Valuation) based on the qualification prescribed for the post will be held to fill the posts for arising vacancies. Candidates who had applied for the post can download the admission tickets through their one time registration profile in the website www.keralapsc.gov.in. As the exam is being conducted at various phases, the date of downloading the hall tickets are clearly mentioned in the exam calendars. Those have registered for the Last Grade Servant exam, the following dates would be more helpful to have the final preparation. Make sure to download the Kerala PSC Calendars (September, October, November and December) to know the dates of exams and hall tickets details. The exam syllabus consists of 3 parts. Part One deals with general facts, current affairs and also about renaissance leaders of Kerala. In the second part, general science and facts are included. The simple arithmetic & mental ability section deals with various questions related to the given syllabus. As the mode of exam is Malayalam, it is important to have depth learning with available sources of learning materials. A serious approach in the preparation of the exam, a systematic learning and dedicated mind would deliver the best reward for the candidates. Working with previous question papers and taking online mock tests of Last Grade Servant exam would do wonders and even give an extra confidence while in the exam.